“For the first time, everyone will have a voice”. Fiji’s Prime Minister Frank Bainimarama’s plan to involve everyone in the formulation of Fiji’s fourth constitution has been translated into action. Consultations with political parties, non-governmental organisations and citizens are taking place all over Fiji to draft a new constitution by 2013. Transparency International Fiji has been training youth and women to empower them to have their say in the new constitution and ultimately be confident to make a submission to the Constitutional Commission. 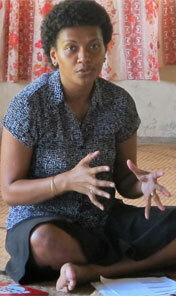 TI Fiji conducted its first one day training session for women in the Suvavou area in Suva on 18 September 2012. The session was part of TI Fiji’s Constitutional Outreach Programme – “Informed Youth. Informed Women” – funded by UNDP. The picture above was taken at a constitutional workshop with Dokanaisuva Youth on 25 September. Participants discussed issues affecting their community (such as job insecurity) and how to best translate them into a submission to contribute to a strong, citizen-driven constitution. At the end of the workshop, a mock Commission was established, comprising TI Fiji staff, Board members and local representatives and a verbal submission was made. TI Fiji’s Constitutional Outreach Programme ran throughout September and into October, with one-day workshops being conducted across Ra Province, in the Suva corridor and in Labasa. The aim of the programme is to provide citizens with information on the process and timeframes for making a submission, and the principals to be included in the new constitution. As a civil society organisation, TI Fiji also made their own recommendations on the new constitution at a consultation at Suva Civic Centre on 12 September. The Chapter’s Chairman, Mr. Apisalome Tudreu, called for a constitution that commits the country to transparency and accountability to ensure that the legislature, judiciary, law enforcement agencies and businesses can remain effective and independent. The introduction of a code of conduct and an integrity pledge for Member of Parliament as well as transparency in political financing should be products of this commitment. PM Bainimarama said the constitution will be based on the Charter’s values of a common and equal citizenry, a secular state, the removal of systematic corruption, an independent judiciary, elimination of discrimination, good and transparent governance, social justice, elimination of ethnic voting, proportional representation and the voting age of 18. Alesi presenting her submission to the constitution to help the women in Nokonoko Ra. There will be no government interference in the public consultations, the chairman of the country’s constitutional commission, Professor Yash Ghai, said. However doubts remain if the consultation process works properly and whether the constitution will be there to stay. Concerns have been raised that people’s participation will be hampered by remaining restrictions on public gatherings and the media. Because of a history of successive coups or a ‘culture of coups’ people fear that their submissions might be for nothing if a new government comes along in the near future and establishes a new constitution. In January 2013, the commission plans to submit a draft of the new constitution to a Constituent Assembly. It will be finalised before the country’s national elections scheduled for 2014. All photos were taken by Jone Siqila who works in TI Fiji’s Communications team.